This face looks highly familiar. 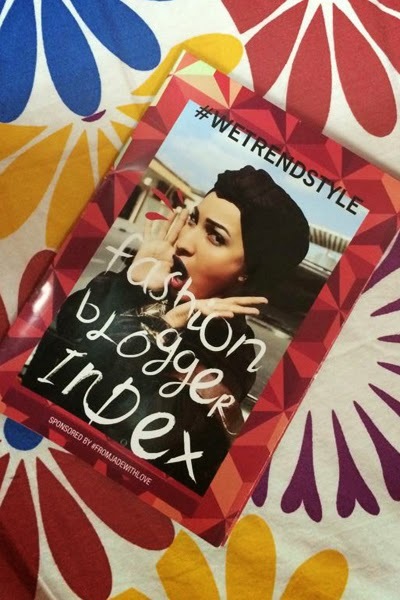 So I never really talked about the #WeTrendStyle Fashion Blogger Index Magazine, that was released during Fashion Forward Season 3. 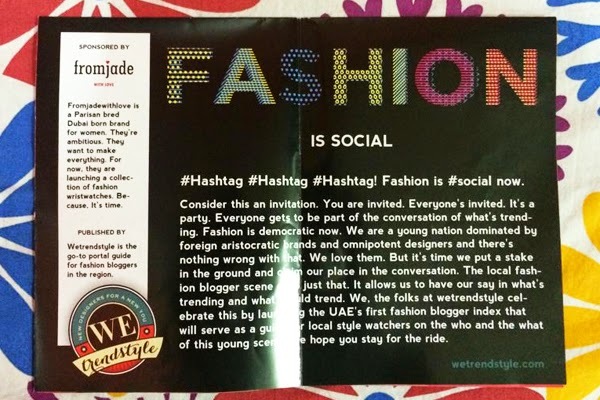 It's actually pretty cool, as it gives you access to most of the UAE fashion bloggers. What's even cooler is that I'm actually on the cover! 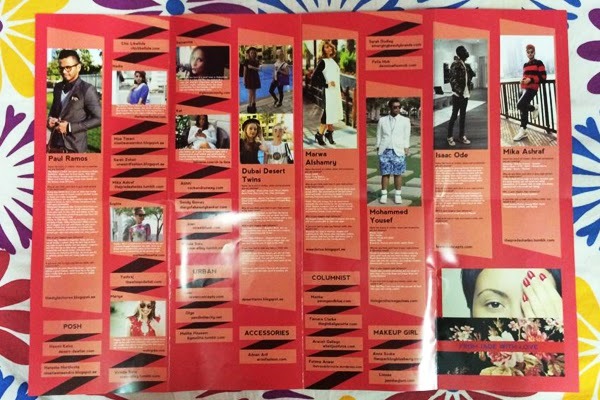 So here is how the magazine looks on the inside, and it works as a fold out. 1. Name the brand of clothes, shoes and accessories you are wearing? 2. Why do you think each item in your style picture is the latest trend? Denim came back strong for the past two seasons, and it seems like it's here to stay. 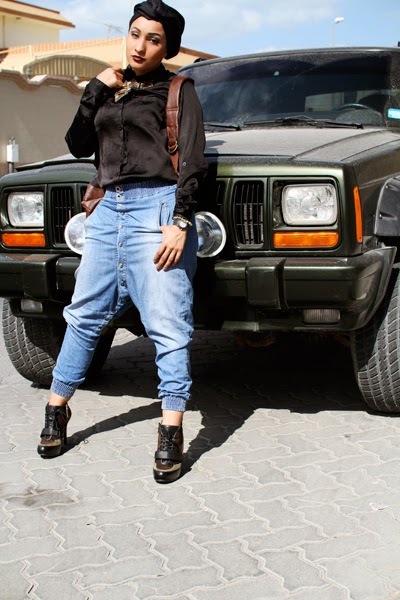 However, denim can be quite irritable and hot for Dubai's unforgiving heat. Not these crazy, loose-fitted pants though. They are definitely a favourite piece in my wardrobe, cause of its extremely comfortable fit. Not to mention that they definitely make a statement, and easily add an edge to your outfit. A simple black silk-like blouse and a statement necklace added a feminine and chic touch to the outfit. This outfit called for my statement Guess shoes, to finish off that grunge/chic outfit. 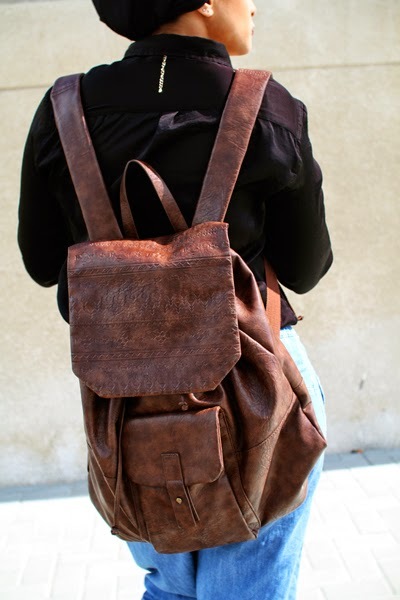 With aztec being a hit this season, this backpack seemed appropriate for this outfit, with its subtle tribal print details. 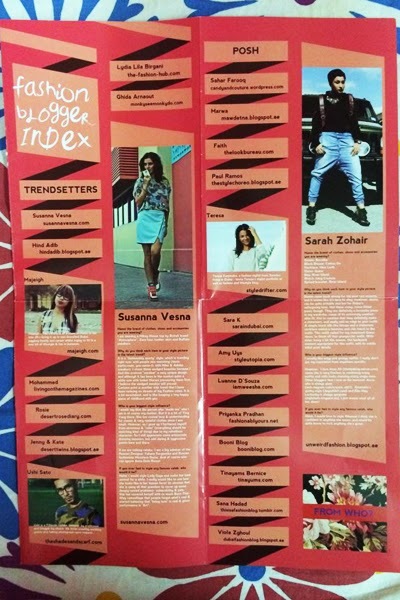 3. Who is your biggest style influence? I usually like edgy and grungy outfits. I really don't get my inspiration from anywhere specific. However, I love Iman Ali from http://thehijablog.werun.com/ cause she is very fearless in combining crazy outfits and stills looks stunning every single time. 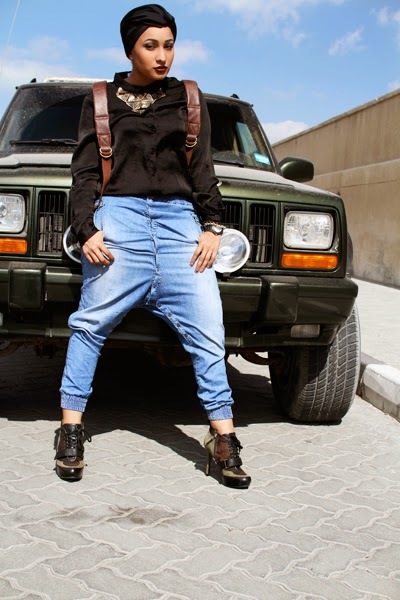 Other bloggers that I love at the moment: Ascia who is always glamhttp://web.stagram.com/n/ascia_akf/ Dinatokio's quirky style http://daysofdoll.com/. and Elle-May Leckenby is always gorgeous http://stylishells.blogspot.ae/. I wanna steal all her shoes! 5. If you ever had to style any famous celeb, who would it be? Hmm, I would love to style Rihanna! I think she is confident in anything she wears, and would be quite brave to rock anything she's given.